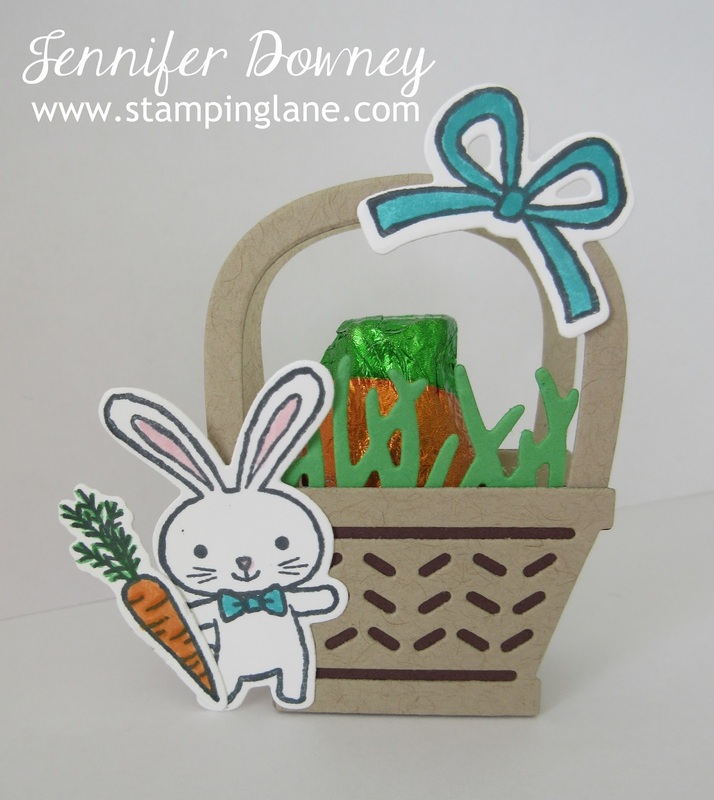 Stamping Lane: Creation Station Blog Hop - Boxes, Baskets & Bags, Oh My! Creation Station Blog Hop - Boxes, Baskets & Bags, Oh My! Hard to believe that March is here already. This year just started and already I feel like I'm behind! Between both parents being hospitalized (my mom is still in there), Jack's schooling, work, and my father-in-law taking a bad fall which I have been helping out until he can get back on his feet, no wonder I feel like that! So I gave myself a pep talk and decided to look ahead towards the upcoming holiday, Easter. We have the ever so cute and fabulous Basket Bunch bundle in the catalog that was just waiting to get inked up! When I first got this bundle, I thought the basket would be so cute if it was 3D. 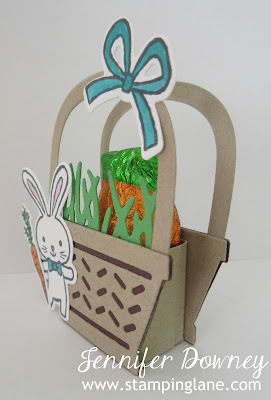 Then when I found out this month's theme was boxes, baskets and bags, I knew I had to give my idea a whirl! I die cut two sets of baskets and then created a little box to sandwich between them to hold a treat. When I was at Target earlier in the week, I found these cute little chocolate carrot candies in the seasonal section. They come in a small netted bag and you get about 10 or so for $1.00. Can't beat that price! I used the candy to create the measurements for the box, so it would fit nice and snug. Then I thought to myself, what if I wanted to showcase a group of these carrots? So I created this cute little box to hold three of them in a row, kind of like a little garden. I created a cute little sign using the Layering Squares Framelits to mimic a garden stake and tucked it in behind the carrots. 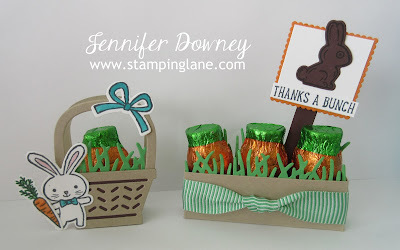 Love that little chocolate bunny stamp and the little grass framelit in the bundle. The grass helps to add depth to my little creations. Too cute! I hope you enjoyed my little Easter treats. I had so much fun creating them! I hope you will continue hopping along to see what the other fabulous designers created today. Baskets, Boxes and Bags, oh my! Happy Stamping! Your carrot garden! What a cute idea.